Home Culture Gender How do people become monks or nuns? Don’t have time to read right now? Consider downloading the PDF of this four-post series here. In college, I considered becoming a nun. I think I was drawn by the focus, the devotion to a way of life. I even took private vows for a year… thinking that if I stepped away from money, dating, and self-promotion, I could clarify other areas of my life. Now if I’m fair… I was poor and not surrounded by dates, so it was more about setting aside the pursuit of hot dates and great wealth, than giving up the reality! And it was a good year, but also a hard promise to make alone. What I took away was that life choices are often best made in community. 1. “Getting to know you.” You contact some religious communities and explore their way of life. You attend retreats or meet with a spiritual director to see if you’re a good fit for monastic life. Some people compare this to flirting or dating in the relationship world. 2. Candidacy. As an “aspirant” or “candidate,” you visit an abbey, convent, or monastery over weeks or months, taking part in prayers, reading, and monastic work. This is like dating gone person: you’re getting to know each others’ way of life, and seeing if it’s a good fit. 3. Postulancy. From the Latin postulare (“to ask”). You live with the community for six months or a year, without taking on the full set of rules. Perhaps this is like going steady, or making plans with a significant other… there’s serious intent, but you’re still free to leave. This is serious. You commit to two years in the community, living in prayer, labor, community life, and fasting, while also studying, developing spiritual practices, and discerning if this is really your life path. 5. Temporary vows. Next, a junior monk or junior nun takes monastic vows for three years of giving up sexual expression, personal luxuries, and independence, and obeying God and religious leaders. This is perhaps most like a three-year contract marriage… a serious and a full commitment and taken with deep thought and faith, but not yet for life. 6. Solemn vows are the last step, taken until death. 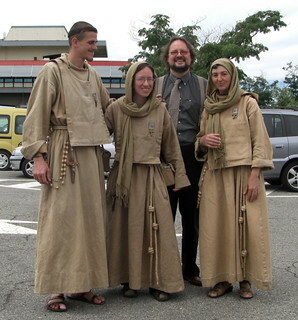 The nun or monk becomes a full and permanent member of their community. This can only be dissolved with a dispensation from the pope. Thoughts: I’m not planning to be a nun, but I remain intrigued by this path. I’m drawn to the idea of discerning your life over time, in relationship with the people around you, and with increasing commitment to a way of life. I appreciate how people are gradually immersed in life and studying, letting them test themselves and the relationship before committing to a path. To me, this recognizes that a hastily-formed vow can harm–and that our discernment can shift over time. Yet it still appreciates how powerful, good, and useful our commitments are. I find this especially interesting in contrast to paired relationships, which you can keep reading at Discernment and the Relationship Escalator!